In fact, one of my least favorite things about my iPad Air 2 is the home button. Over the last two years, it has become increasingly tired, shifts in its seat, and generally feels kind of cheap and janky. A capacitive, haptic key would be a godsend. But this post isn't about Apple: it's about Samsung. Samsung remains the only holdout of note on the physical home key in 2016 (and really, most of Android's history), to the extent that it is now an iconic - if increasingly anachronistic - part of their Galaxy smartphone brand identity. I have long believed, and still do, that Samsung's home button exists almost solely to ease the transition for iPhone owners to Galaxy-brand smartphones. It makes them approachable. If you're the kind of person who doesn't really care about smartphones so much as know they want and need to own one, a Galaxy phone's very fascia looks recognizable coming from an iPhone. You know what that big, clicky button on the bottom is for right from the get go: it's the portal into the device, to taking that first step in learning what it is to use a Galaxy smartphone. And you know that you need to click it. This may sound like something utterly trivial to you, and to phone enthusiasts like us, it kind of is. We know how phones generally work, and can pick a new one up and figure it out in no time at all. But Samsung is a mass market brand, and these things matter a hell of a lot when you're trying to make your product appeal to someone who has only ever owned an iPhone. "Oh, so you turn it on like the iPhone" is exactly the initial reaction Samsung wants from consumers. It puts them at ease - it is familiar. But on the newest iPhone, that click is no more. It's now a bit of an abrupt tap-buzz. A lot like, I don't know, pretty much every Android smartphone with a fingerprint scanner that isn't made by Samsung? Yeah, that's right. 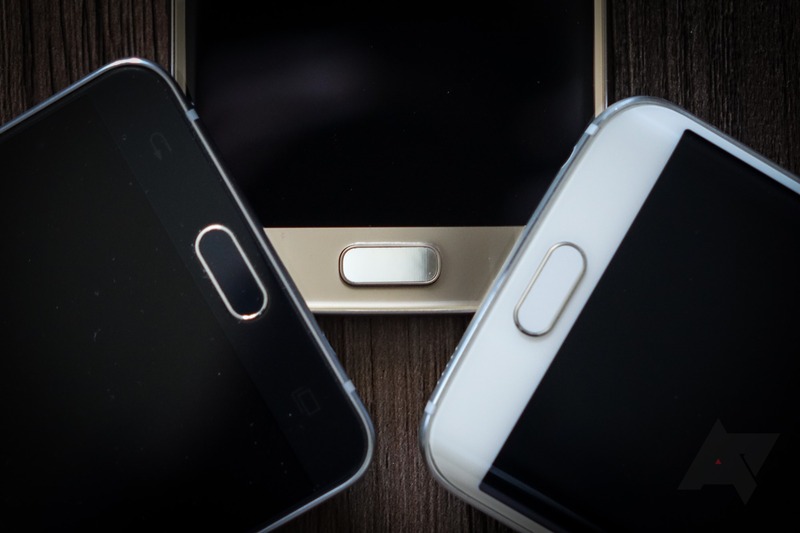 The question then becomes what Samsung values more: the iconic if not particularly interesting "look" that home button gives its phones, or in continuing to ensure that iPhone converts have that initial feeling that things on this side of the fence aren't all that different or scary. I am certain yesterday's announcement (and the rumors leading up to it) has Samsung considering its next steps with the Galaxy's home button very seriously. On the one hand, users who upgrade from iPhones in the next year will be coming from older devices, so there's no rush just yet to get on board with haptic-capacitive from that perspective. On the other, there is the issue of looking behind the times now - as though Apple has surpassed Samsung's quaint little mechanical home key, of appearing to be stuck in the past. And that may be too much for a prideful brand like Samsung to bear. But it'd be silly to suggest Samsung's products exist in a vacuum: its entire smartphone brand is the anti-iPhone. So much of the attention it receives is by virtue of comparison to Apple (in the mainstream media, I mean - not enthusiast sites like this one). I, for one, would be happy to see Samsung's physical home button go the way of the dodo. It's a relic in the age of ultra-fast fingerprint scanners. Galaxy fans may think otherwise, but when it comes to growing market share and profits, it's iPhone owners that are the apple of Samsung's eye.